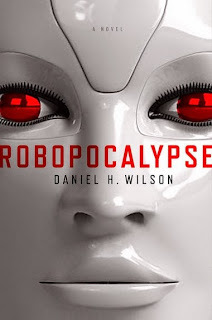 I'm going to use the term "read", but I didn't read Robopocalypse, I listened to it. My local library had the audio book, and because I'm commuting more than usual, I decided I'd experience the story through my car speakers. Robopocalypse is a distant but not distant future that feels familiar, even though we haven't reached that point in reality. The future is normal, robots are used to fetch groceries and run errands, cars are self-driving, everything is automated for our convenience. A true A.I escapes an underground research facility with one goal, to allow his people to thrive and embrace the future. One review stated that Robopocalypse was World War Z with robots, and that has been the most accurate description so far. Both stories use the same narrative style of collections of stories that detail their respective wars from beginning to eventual victory. The narration by Mike Chamberlain is great. In the later chapters, when he switches between the multiple characters in the story and the narrator describing the events, it's absolutely seamless with no awkward sections. The story is good. I enjoyed it, but it has problems. The style of storytelling switches between characters so often, that it's difficult to care for any character, because most show up and are gone. Certain characters do repeat, but because there is so much time between their chapters, I don't feel connected to them or their situations. The jumping focus on one hand is a problem, and on the other hand the reader experiences a number of different types of story in quick succession. I enjoyed the two planes scheduled to fly into each other by Archos, but because of the quick thinking of the pilots and air traffic control disaster is averted. It's simple and short, and I may have enjoyed it because of the lack of the omnipotent killing machines and gore that are in so many other chapters. Sections such as these allowed breathing room in a story that likes to maim and kill at every opportunity. And for the most part, the story is solid, but from time to time it delves straight into cheese. These can be things characters say with no real buildup to stiff exposition. The writing is strong, it can just be inconsistent.